It's no secret around these parts, I love chai. I love the spices, the tea, the scent, the warm and cozy feelings evoked by all of the above -- what I don't like is buying it. Sure I'll buy a select few whole leaf chai blends, but I'm not a fan of that pre-bagged stuff. One of my favorite concentrates available for home-use is Oregon Chai Concentrate, which is great for on-the-go chai-ing or when you're in a pinch, but it's a little bit too sweet for my taste, and by the time I dilute it with milk, the chai flavor has become too dilluted too -- so you see my dilemma! After way too long (read: several hours) of surfing the net trying to find a decent chai concentrate recipe that was neither too time consuming nor had an ingredient list three pages long, I found Lucy's Recipe. 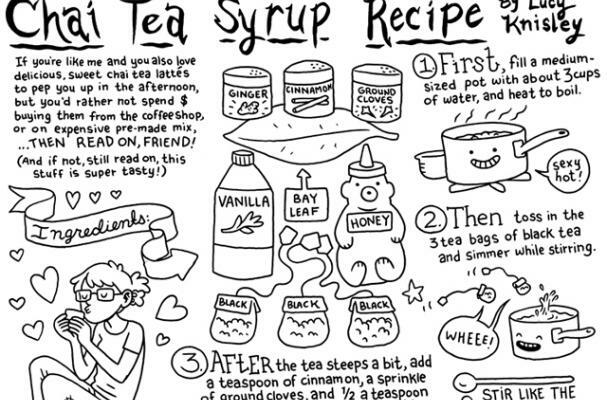 Not only is this recipe awesome, but her visual representation makes it way more fun to read/use! Eeee!! So I made this concentrate today and it is amazing! I doubled the recipe to be sure I had enough (my fiance is a BIG sweets guy, and I know he'll drink it all before I have any) and added some other things. My mother gave me a pack of spices in their whole forms from india and so I crushed 3 cardamom pods and popped them in, as well as a small pinch of crushed black peppercorns. Mmmmm spicyness. I will be making this a whole lot more, specially as it gets colder! I'll try this one one. I prefer to use my own <a href="http://chaiteasite.com/chai-tea-recipe">Chai Tea Recipe</a>, but it is good to try these concentrates for things like iced chai tea or espressos.